From Manresa, Iñigo journeyed to Jerusalem where he joyfully immersed himself in reliving Jesus’ earthly life as he visited each of the holy places. Despite of wanting to remain in the Holy Land, this proved impossible. It is a measure of how single-minded he had become about discerning and carrying out the will of God that he unreservedly accepted the directive of the Franciscan provincial and, in September 1524, returned to Spain. By now he realised that, in order to carry out the work for which God had called him, he needed a solid education. He began at Barcelona with studies that included rudimentary Latin. After two years he moved to the University of Alcalá where he undertook a program of liberal education. From there he went to Salamanca where he stayed about six months. Meantime he continued to share his insights with anyone he met and to give the Spiritual Exercises. This even included two short spells in gaol where he was cast by authorities suspicious of his apostolic teachings and the enthusiasm of some women who were profoundly moved by his spiritual conversation. Ultimately he was cleared of any irregularity in his teaching and in February 1528, he went to Paris to continue his studies in theology. It was in Paris that his life’s work finally began and where he decided to change his name to Ignatius. After some further travels, in 1529 he settled in to study at the University of Ste Barbe where he soon made friends with his room-mates fellow-Spaniard Francis Xavier (1506-1552) and Frenchman Peter Favre (1506-1546). Bobadillo, and the Portugese Simon Rodrigues. Each member of the group had resolved to dedicate the rest of his life to serving God singlemindedly. In order to discern what this might mean in their life as individuals and as a group, Ignatius led each of them privately through the Spiritual Exercises over the course of 1534. On August 15, 1534 this little group of seven took religious vows in the small chapel of St Denis, close to the great basilica of Sacre Coeur at Montmartre. As part of this dedication, they vowed to offer themselves to the Pope to be totally at his service, ready to go to whatever mission and whatever part of the world the Vicar of Christ should see fit to send them. This promise of obedience directly to the Pope remains a distinctive feature of the Jesuit order. another planned to go to Rome to offer themselves to the Pope in fulfilment of their vow. However another war broke out so that it wasn’t until 1537 that the little group, now ten (with Codure, Le Jay and Broet), arrived in Venice and began to preach and minister to the sick in hospitals. 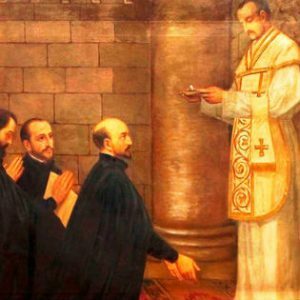 It was here in Venice that Ignatius and those of his companions who were not already priests, were ordained on June 24, 1537. 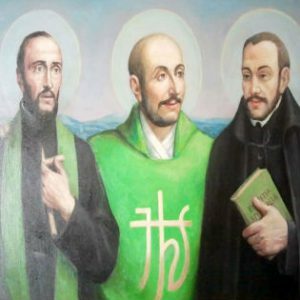 Finally, they travelled to Rome in smaller groups, Ignatius with Favre and Lainez, arriving there in 1538. As they had done from the beginning, now in Rome they worked with the poor in the city, cared for the sick in hospitals, preached and taught catechism. Ignatius also established a refuge where reformed prostitutes could begin a new life with the support of the women friends he appointed to run the home. Meanwhile, Ignatius, as Superior General, completed the Constitutions and exercised his ministry of governing the Society, expanding its mission into schools, universities and other good works from Europe to the Far East. He died in Rome on 31 July 1556.